His appointment as next chair of the Federal Reserve would be a clear sign that narrow financial interests are still in charge of the Democratic Party. The leaders of the Democratic Party have never come clean about their ruinous role in the economic policies that led to the financial collapse of 2008. The party’s refusal to admit blame is the real source of the intense public anger ignited by the White House suggestion that President Obama may choose Lawrence Summers to succeed Ben Bernanke as Federal Reserve chair when Bernanke’s term expires in January. Among left-labor Democrats pushed aside during the Clinton and Obama years, Summers epitomizes grave error and arrogance. His appointment as Fed chair would be a signal that the financial interests led by Robert Rubin, Clinton’s treasury secretary from 1995 to 1999, intend to maintain their control over the party, never mind the destructive policies they engineered in the past—gutting the middle class with financial deregulation and job-killing trade deals. To stop the Clinton-Rubin crowd, rank-and-file constituents must sound the alarm, and Democratic senators must promise, loud and clear, to vote against Summers if Obama once again follows that crowd’s lead. The former Harvard president was himself a Wall Street player between his government positions, and he was known to be banker-friendly as Obama’s first-term adviser. Choosing Summers for the Fed would be another great gift to the mega-banks. Summers’s reputation was (and is) that of a bully in policy fights. Some people called him “the smartest man in the room,” and he believed it. 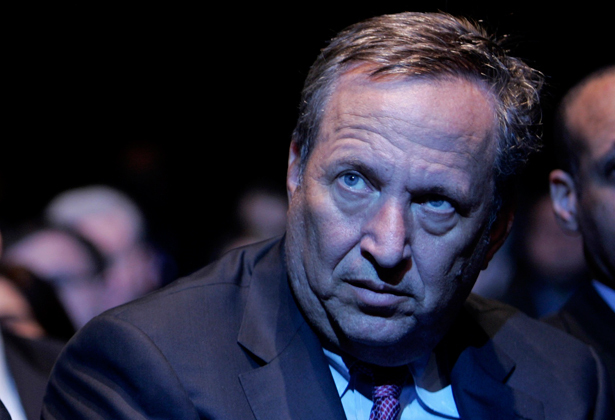 As treasury secretary during Bill Clinton’s second term, Summers personally did the knife work that cut up Brooksley Born, the brave chair of the Commodity Futures Trading Commission who fought to impose limits on the explosive derivatives market. He still owes Born—and the country—an apology. When Summers returned to Washington in 2009 as Obama’s chief economic adviser, he pushed aside rival views, underestimating both the depth of the crisis and how to deal with it. When advisers like Christina Romer called for much stronger stimulus measures, Summers urged doing less, and he accepted disappointing results as the best that government could do. Obama adhered to that advice. Summers was wrong on the big questions and, alas, so was Obama. More recently, Summers has been trying to rewrite his reputation as he campaigns openly for the Fed appointment. The Washington Post offered him a prime pulpit for a series of op-ed columns in which he’s made himself sound like a bleeding-heart liberal. Don’t be misled. Those who dig into his old speeches and pronouncements will find rich material to make the case for rejecting him. The question is not about left or right policy decisions. It’s about competence. The best reason to put Summers out to pasture is that Obama has a far better choice available: a more experienced central banker and moderately liberal economist named Janet Yellen. Now vice chair of the Federal Reserve Board in Washington, Yellen has been a close ally of Bernanke and a strong voice for fighting unemployment and other structural weaknesses in the economy. She served as president of the San Francisco Federal Reserve Bank, and before that served a term as a governor of the Fed before Obama appointed her as vice chair. Her record is stellar: a recent Wall Street Journal survey of forecasting by all the top Federal Reserve officials between 2009 and 2012 found that Yellen was the most accurate of all. It doesn’t hurt that Yellen would be the first woman to serve as Fed chair. It’s about time: this year is the 100th anniversary of the central bank, and the stolid masculinity of this cloistered institution has failed the country spectacularly. It needs to be ventilated by public debate. Choosing Yellen would be a fitting rebuke to Summers, whose bigotry got him bounced as president of Harvard after he made derogatory remarks about women as scientists and dissed black professors as inadequate scholars. The Federal Reserve’s reputation was gravely diminished by its failure to foresee the financial collapse and again by the bailouts. People don’t trust the central bank, for good reason: they could see with their own eyes that the Fed spent trillions to rescue the mega-banks while leaving others to drown. The Fed’s incestuous relationship with these banks demands fundamental reform. Obama should ask himself which candidate would be most likely to restore public trust in the Fed—the glib talker from the old boys’ club, or the experienced woman ready to make history? Editor's Note: This piece originally referred to Robert Rubin as Bill Clinton's first treasury secretary. Serving from 1993-1994, Lloyd Bentsen was Clinton's first treasury secretary. Rubin served as secretary from 1995-1999. Robert Scheer also thinks that Larry Summers would be a bad choice for Fed chair, arguing that he would hurt the middle class.